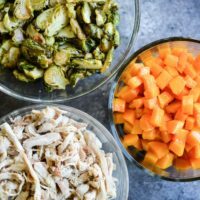 These simple recipes are easily meal prepped to create 3 delicious and diverse dinners throughout the week! Dust the chicken thighs with 1 teaspoon sea salt and ½ teaspoon black pepper. Add chicken to a large pan with a lid over medium-high heat and cover with 5 cups of water or chicken broth. Place the lid on the pan and simmer for 15-20 minutes. Cook for 6-8 hours on low, then shred with two forks or the paddle attachment of a stand mixer. Dust the chicken with 1 teaspoon sea salt and ½ teaspoon black pepper. Place chicken in the slow cooker and cover with 5 cups water or chicken broth. Cook for 6-8 hours on low, then shred with two forks or the paddle attachment of a stand mixer. Place chicken in the Instant Pot along with ½ cup water or chicken broth. Close the lid of the Instant Pot, ensure the pressure valve is sealed, and set the cooker to “poultry” mode for 20 minutes. Once the timer goes off, quickly release the pressure valve, open the pot once all steam has been released, and shred the chicken with two forks or the paddle attachment of a stand mixer. Heat the oven to 375 F. Cut both butternut squash in half, scoop out the seeds, and place cut side-down on 2 baking sheets. Add ½ cup of water to the pan. Bake 60 minutes, until tender. Preheat the oven to 375 F. Remove the stems from the Brussels sprouts and cut in half. Toss with one tablespoon olive oil and ¼ teaspoon sea salt. Spread out on a sheet pan and bake 45 minutes. You can do this at the same time as the butternut squash if there’s enough room in your oven. Store all meal components in an air-tight container in the refrigerator.